Ever since his debut on wax in 1992, when he stole the show on Main Source’s classic posse cut Live At The BBQ, Queensbridge emcee Nas is one of Hip Hop’s hottest properties and preeminent figures. Widely considered one of the best emcees ever, Nas truly is Hip Hop royalty. In over two decades in the Hip Hop game (is there a more lauded album in Hip Hop than Nas’ 1994 debut Illmatic? ), Nas has dropped so many outstanding singles that compiling a Top 15 will inevitably leave out a lot of bangers. This list contains HHGA’s favorite Nas tracks – if you miss YOUR favorites in this list let us know in the comments! One of Nas’ more radio-friendly songs. A great collaboration with Lauryn Hill and a brilliant recreation of Kurtis Blow’s old school classic, Nas paints a picture of how his version of utopia would look like. Nas shows his longevity and continued relevance in Hip Hop on this 2012 track. A heartfelt song, especially for guys who have daughters. One of the best tracks of Nas’ underrated second album It Was Written. 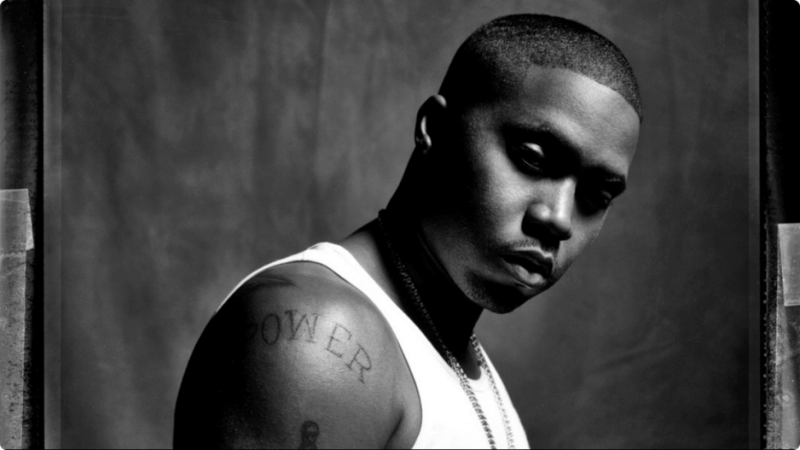 Nas kills it over a dope beat with a recognizable sample of a classic Ultramagnetic MCs line. All tracks on Illmatic are classics in their own right. This is one of the most laid back cuts on the album. It has Nas reminiscing about the days of way back over a smooth and melancholy DJ Premier instrumental. An emotional highlight on Illmatic, Nas’ verses are basically a letter to his homie Cormega in jail. The nice xylophone beat-backdrop is provided by Q-Tip, who’s voice also echos on the chorus. One of the hardest, if not THE hardest, diss track ever. Nas destroys Jay Z completely in response to Jay dissing Nas in the second verse of his Takeover track from The Blueprint album. A nostalgic look back on New York in the 1980’s, Doo Rags is one of the stand-out tracks from the all-around excellent The Lost Tapes album. One Mic is Nas’ love declaration for Hip Hop. It shows that Nas at this point still has more heart than any other rapper in the game. Powerful material. No matter who the barbs in the song were directed at (2Pac? Biggie?) – this track has to be one of the most underappreciated in Nas’ vast body of work. Top notch lyricism and wordplay. The instrumental is on point too, with a dope beat and brilliant use of a famous Sting guitar riff. Over a classic beat provided by Pete Rock, who brilliantly interpolates the old school classic Its Yours by T La Rock, Nas drops three dope verses. Perfection. Another perfect Nas – DJ Premier collaboration. Over Preemo’s crazy creative instrumental, Nas drops some trademark verses. Another IIlmatic highlight which perfectly captures the essence of the young black males growing up with the prospect of violent death or being incarcerated looming over them. Nas kills it as usual with his verse, but it is guest AZ who steals this particular show with a killer verse of his own. Hip Hop trivia: it’s Nas’ father Olu Dara who provides the trumpet solo at the end to finish off this classic joint. A masterpiece. Excellent intstrumental by Large Professor and loaded with samples, especially the brilliant looping of Michael Jackson’s Human Nature stands out. Filled with quotables – Nas at his best. An awesome street banger with a perfect Golden Age / old school vibe to it, Made You Look was the first single of God’s Son – Nas’ third release in little over a year (after Stillmatic and The Lost Tapes). These three releases reafirmed Nas’ postition among Hip Hop’s elite, after the less acclaimed 1999 outings I Am and Nastradamus. The quintessential Nas track and one of Hip Hop’s best songs ever, bar none. A classic narrative of life on the NYC streets, this is one of the many classics Nas’ partnership with DJ Premier would yield and just maybe the biggest of them all.